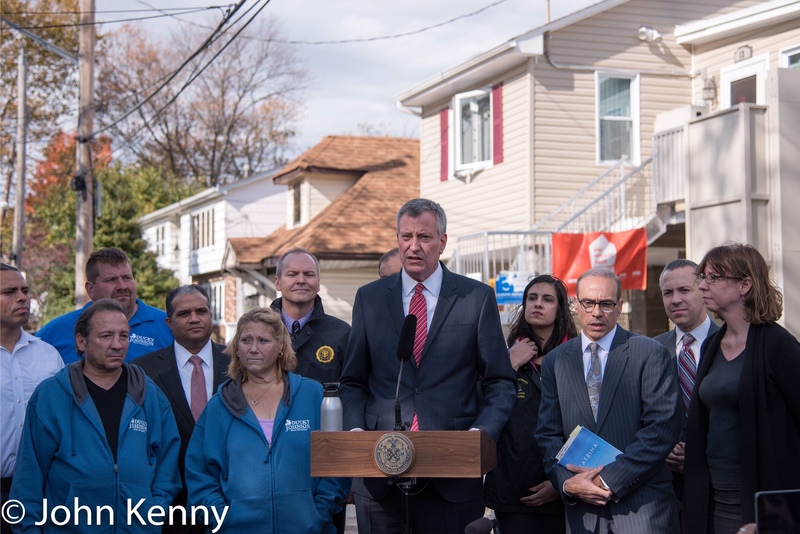 Mayor Bill de Blasio marked the fifth anniversary of Hurricane Sandy today with a Rockaway press conference and presentation on several resiliency projects. de Blasio was joined at the Arverne YMCA by Queens Borough President Melinda Katz, NYS Senator James Sanders, Council Member Donovan Richards, NYC Director of Resiliency Dan Zarelli, Director of the office of Housing Recovery Amy Peterson and Parks Commissioner Mitch Silver. Council Member Eric Ulrich harshly condemned the City’s Build It Back program Monday, calling for the resignation of Amy Peterson, the Director of the Mayor’s Office of Housing Recovery Operations who oversees Build It Back. Speaking at a press conference on Beach 117th Street in Rockaway, Ulrich described Build It Back as hopelessly failing with little visible prospect of success. The owner of the home Ulrich spoke in front of has been displaced since February, having moved out in anticipation of substantial work through Build It Back. Shortly after the owner relocated Build It Back erected a fence, effectively locking out the homeowner and preparing the property for that work. According to Ulrich and the daughter of the homeowner that work has not yet begun, however. Ulrich further described this homeowner’s experience as common, saying that many of his constituents are in similar circumstances. 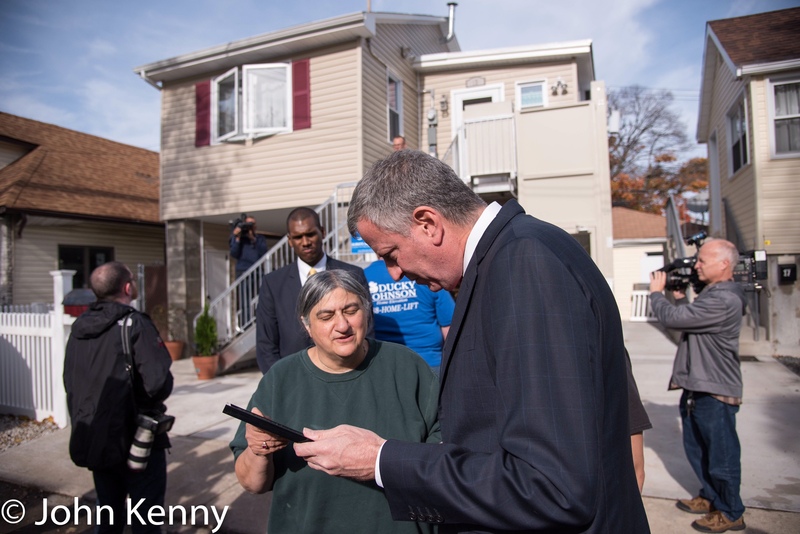 Mayor Bill de Blasio marked the third anniversary of Hurricane Sandy with a visit to the south shore of Staten Island. Click here for our full photo gallery. Coverage of the press conference is here. Our full photo gallery is here. Mayor Bill de Blasio marked the third anniversary of Hurricane Sandy today with a visit to Staten Island’s south shore. 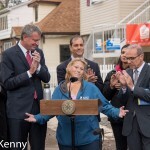 Appearing in front of a home rebuilt by the Build It Back program, de Blasio lauded the progress in Build It Back during his administration. He announced that the program is to be completed by the end of 2016 and detailed the evolution in the program from the time he took office. Among the statistics he cited were “2,015 construction starts (including 1,217 construction completions), as well as 5,319 reimbursement checks totaling nearly $104 million”, while noting that each of these categories was at zero when he took office. There was both on topic and off topic Q&A. Mayor Bill de Blasio visited Breezy Point today, joined by Secretary of the U.S. Department of Housing and Urban Development Julian Castro. 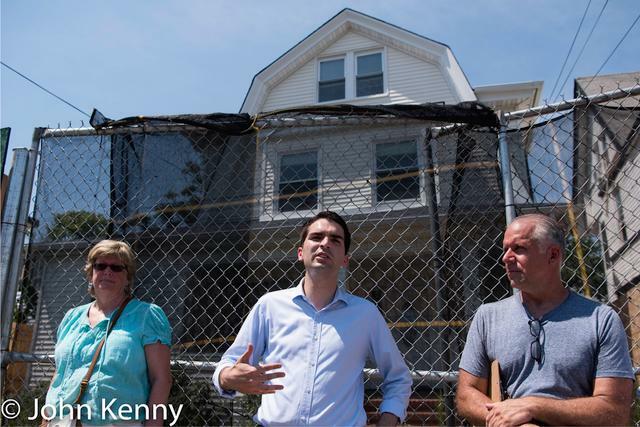 Their appearance two days ahead of the third anniversary of Hurricane Sandy’s landfall was intended to laud the progress in the City’s Build It Back program, and included a separate visit with a Breezy Point family just returned to their rebuilt home. de Blasio and Castro were joined by Council Speaker Melissa Mark-Viverito, Assembly Member Phil Goldfeder (who represents Rockaway), Council Member, HPD Commissioner Vicki Been, Housing Recovery Office Director Amy Peterson, Resiliency Director Dan Zarilli, HUD Deputy Assistant Secretary Marion McFadden and HUD Regional Administrator Holly Leicht. Mayor de Blasio’s staff had announced the press conference as fielding “on topic” questions only. 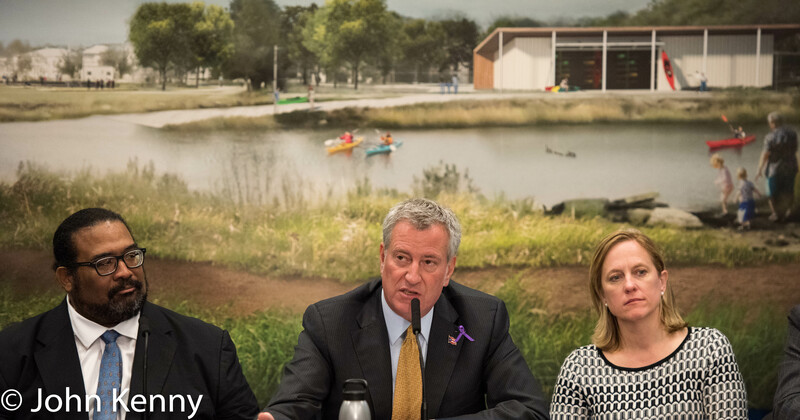 de Blasio implemented that restriction even more restrictively, declining to answer “on topic” questions addressing the planning and future operation of the ongoing recovery efforts. Question topics included the estimated time for completion of all of the Sandy recovery home rebuilding, the implementation of new flood maps, whether de Blasio’s reported future endorsement of Hillary Clinton is tied to a longterm need for federal government assistance, whether in Secretary Castro’s view the City could do better on any element of Sandy recovery efforts, communicating an increased sense of urgency to City agencies, significant variations in the reported number of Build It Back applicants, how the City will continue its increased rate of repairs, details on the construction firms used in the program and praise for developer Gerry Romski. Mayor Bill de Blasio marked the second anniversary of Hurricane Sandy with a press conference on the beach in the Midland Beach section of Staten Island. 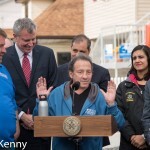 Earlier, he had participated in a home rebuilding in Coney Island. de Blasio was joined at the press conference by members of his administration, including Amy Peterson, Dan Zarelli, Mitch Silver and Bill Goldstein, and elected officials including state senators Diane Savino and Andrew Lanza, council members Steve Matteo and Alan Maisal, Borough President Jimmy Oddo and Council Speaker Melissa Mark-Viverito. We’ve divided the video of his Q&A as de Blasio did during the press conference; Sandy-related, Ebola-related and off-topic. Today Mayor Bill de Blasio held a press conference promoting his administration’s advances in the Build It Back program. Created to assist homeowners in the aftermath of Hurricane Sandy, Build It Back was immediately mired in bureaucratic quicksand, producing virtually no assistance to any homeowners by the close of the Bloomberg administration. 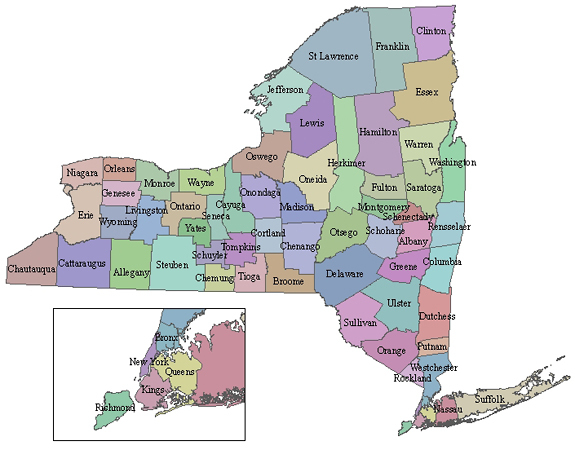 Although the program continued to drift in the early months of the de Blasio administration, it has markedly accelerated its efforts since the late March hiring of Amy Peterson as Director of the Office of Housing Recovery. The mayor has set a Build It Back goal of 500 construction starts and issuing 500 reimbursement checks by Labor Day. While modest compared to the estimated 20,000 or more homeowners who could be helped under the program, that’s a dramatic improvement from the program’s first year in which virtually no homeowners received such assistance. In today’s press conference, the mayor announced that Build It Back has had 132 construction starts and issued 397 reimbursement checks. On topic questions included funding for items in the City’s SIRR report and whether there is an alternative source for such items, whether the mayor is satisfied with the pace of City spending of federal money for Sandy relief, whether the mayor is confident of reaching his 500 construction starts and 500 reimbursement checks by Labor Day, Comptroller Scott Stringer’s report on a lack of oversight on spending by the Department of Homeless Services, whether the City has the “right formula” for Build It Back, the total number of homes damaged by Sandy and when all will reached through Build It Back, how many of the 132 construction starts to date are repairs and how many are rebuilds and whether the mayor has closely examined the City’s emergency management system in the context of preparing for a future coastal storm. Off topic questions the Long Island Railroad and possible strike, the City’s contingency plans and role in the event of a strike, whether the petitions supporting continued operation of horse carriages, with 40,000 signatures recently delivered to City Hall affect his thinking on the topic, what the 66 donors to Campaign for One New York expect from the mayor, whether he plans to take any additional vacations this year, what initiatives Campaign for One New York will next focus on, the status of the review of the 911 system upgrade and, concerning his trip to Italy, whether he is packed, whether he’s packing his own bags and what food he is most looking forward to.